Creating loving memories of your sweet babies is such a treasure. Create gifts for grandma and grandpa that they can use! This design is perfect for your baby's number one fans! This design is for baby boys. The background is a baby blue plaid. 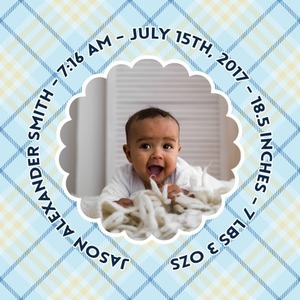 In the middle of the design is a scalloped frame to upload your baby's picture into (make sure it is high quality!). Surrounding the frame is where your personalization goes. Put their name, birthday, or whatever you like. In our design center you are able to easily upload photos! Make sure your picture is high qualtiy for the best results. Add any kind of personalization you like and even change the background. Have fun designing!